In front of 400+ at the ShoWare Center, the Stars Reserves continued their fine form with a 9-2 Grit City Derby win over Narrows FC. The Stars Reserves remained unbeaten at 7-0-0 and on top of the WISL with the win. Mark Lee got the scoring started four minutes into the game on Jeff Bader’s first of three assists. Edwin Brown and JJ Schmeck each added goals in the second quarter and the Stars took a 3-0 lead into halftime. They built a 5-0 lead on two goals by Nate Ford to start the third quarter before Narrows finally got on the board with a goal by JC Henson. Adrian Correa answered right back for the Stars to make it 6-1 and Jeremy Maldonado scored Narrows’ second goal with 1:40 left in the third. But the fourth quarter was all Stars, as they added three more goals including Brown’s second and goals for Logan Jones and Beau Macaluso, and goalkeeper Mike Arguello kept Narrows from adding any more. After just one goal in the first half, the Skyhawks and Artesians combined for three goals over the final three minutes with Eli Boatright’s game tying goal with 17 seconds left resulted in a 4-4 draw at the Snohomish Soccer Dome. Oly Town’s Ryan Fakkema and Snohomish’s Trevor Davoren both played a fantastic first half, with just one goal by the Skyhawks’ Tony Clarke. The struggling Artesians played their best quarter of the season in the third, taking a 2-1 lead on goals by Nate Boatright and Esau Vazquez and then killed two Snohomish power plays. Snohomish answered with two goals of their own to open the fourth quarter thanks to Issac Orellana and Devin Shull. But the Artesians rallied and Collin Tate tied the game, 3-3, with 2:49 left. Kyle Aure looked like he might have broken the hearts of Oly Town with the go ahead goal with 1:31 left, but 16 year-old Eli Boatright fought through a defender after receiving a pass from Tate, and slotted home the game tying goal with 17 seconds left. The draw, coupled with an Oly-Pen Force loss, moved Snohomish into third place in the WISL while the Artesians picked up their first league point in over a year and their first point ever in Snohomish. 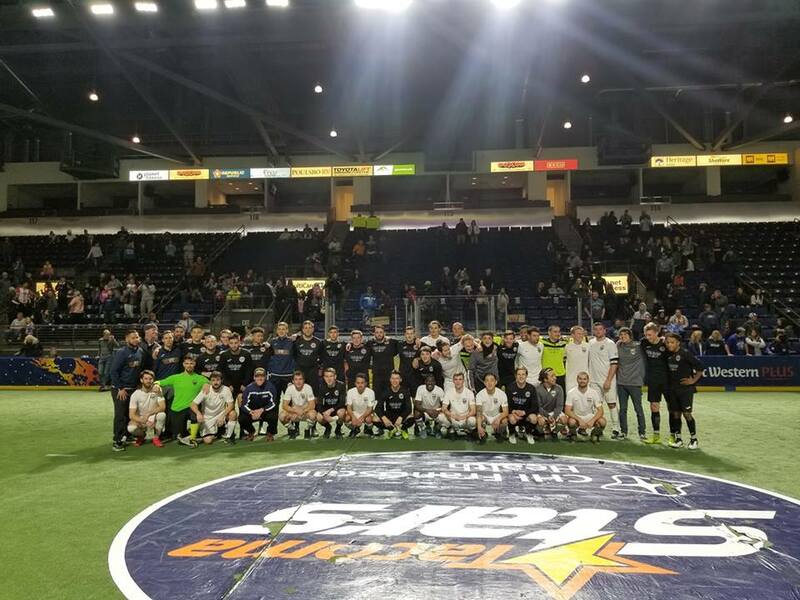 The Oly-Pen Force battled and kept the game close through three quarters, but Bellingham United continued their dominant play at the Bellingham Sportsplex with a 9-4 victory in a game that saw Richard Henderson score his 100th goal with the club. Bellingham struck first and jumped out to 3-0 lead on goals by Eduardo Perez, Kenny Parker and Uriel Herrera before Kevin Flavin made it 3-1 early in the second quarter. The two teams traded goals and then Christian Caro gave United a 5-2 lead with a goal just before halftime. The Force and goalkeeper Cole Weaver blanked the Hammers in the third quarter and David Meherg’s goal at the 8:43 mark made it a two goal game, 5-3, going into the fourth quarter. But the Hammers took control quickly in the fourth with goals by Nick Cashmere, Perez and Herrera and closed out another win in Bellingham, 9-4.